← Why choose Oakley part 3! 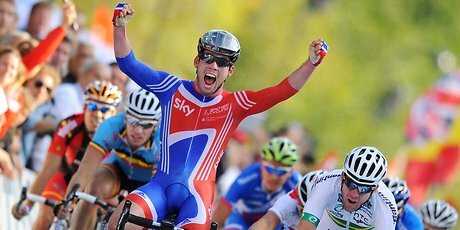 Mark Cavendish Claims World Road Race Title in Copenhagen!! Are you ready for the 2012 hype to begin!! Oakley’s Star Cyclist claimed a bold victory at the World Road Race Championships in Denmark by dominating a sprint at the tail end of the race, sealing the first Rainbow Jersey for Great Britain since 1965!! Makes you proud to be British!! The first charge for Mark came early in the race – with an eight-man breakaway taking shape and going on to build a lead of almost 10 minutes on the main group. With only six laps left to go, hopes for many of the contenders were crushed when a crash forced the bunch to split. Big congratulations from the team at Outlet-Sunglasses!! This entry was posted in Oakley Sunglasses, Sports News!. Bookmark the permalink.